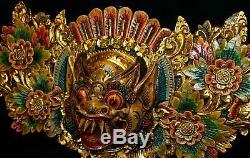 Balinese Boma Demon Mask Wall Panel Child of the Earth wood carving Bali art 24. 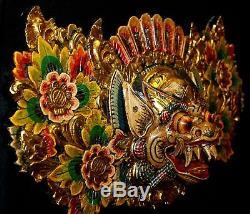 Balinese Boma Guardian Mask Hand carved in Bali by talented carvers from pule wood. 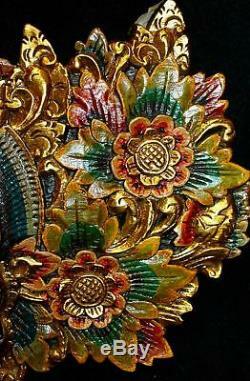 It is then hand painted in the traditional style in colorful antique red with green and blue finish, with gold leaf highlights. This Mask is Boma, also known as "Child of the Earth". 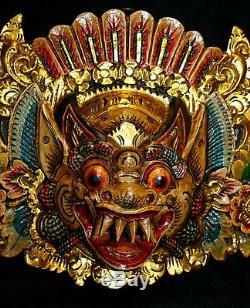 Born to Dewa Wisnu & Dewi Pertiwi the Mother Earth Goddess, Boma was known as an evil demon. 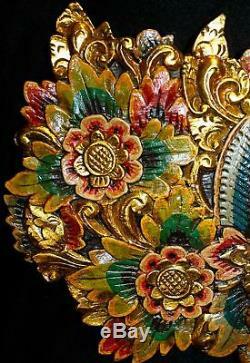 After his death he was transformed into a benevolent spirit & guardian. His image is placed above doors and windows to this day to offer protection to the inhabitants and to maintain the fine balance between dark & light forces of the universe. Each mask will have slight variations in carving, size & paint placement. This is not a flaw, but a reflection of the unique handcrafted origins of this product. Size: 24" long - 5" deep - 13" wide - 1" thick. Ships FAST from our location in the USA. 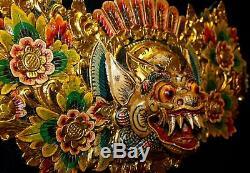 Traditional mask, mermaids, winged mobiles, architectural finds, antiques, home decor treasures, batik clothing & silver jewelry and so much more. 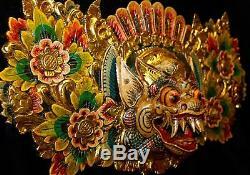 The item "Balinese Boma Demon Mask Wall Panel Child of the Earth wood carving Bali art 24" is in sale since Sunday, August 27, 2017.